Rising out of the darkened stage at the Zellerbach Playhouse was a single elongated image of layered colors in light shining on the back left of the stage. A huge projection of the game board of Paramapadam, what we would recognize as Snakes and Ladders, fell on the floor of the stage. Across the blue field of the board, red ladders leaned and large black and white snakes tapered in curves from head to tail tip, connecting squares. Across the bright game board five women were placed like tokens. Dressed in bright sari silks with a pleated fan-like panel hanging at the front of their waist and falling to the shins, the women were decorated with jewels and flowers. They stood in different poses, facing in different directions. Ragamala Dance Company in Written in Water. Photo courtesy of Ragamala Dance Company. A rapidly tapped drumbeat, and a woman begins to sing. She is Preethy Mahesh, well known and honored for her vocal accompaniment to Indian classical dance. As the music unfolds, a jazz trumpet blends with the ensemble and then solos. Now and then the trumpeter, Amir ElSaffar, is joined by violinist Arun Ramamurthy. ElSaffar and composer Prema Ramamurthy have created an extraordinary fusion of sound, blending into an arresting global sound. 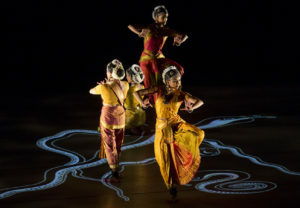 Exotic in its both its tradition and its contemporary revision of those traditions, the Ragamala Dance Company shimmers through its performance of Written in Water, a carefully considered and exquisitely performed work of classical Indian dance; presented at the Zellerbach Playhouse by CalPerformances. Ranee Ramaswamy formed the company, which now resides in Minneapolis, in 1992. Trained in the South Indian dance of Bharatanatyam, she trained her daughters in the form, and they shape the core of the company. Aparna Ramaswamy shares artistic directorship with her mother and Ashwini Ramaswamy is their choreographic associate. Bharatanatyam is considered one of the oldest dance traditions in India, dated from A.D. 2nd century. It was traditionally performed by women, often as a solo dance, and expressed religious themes and spiritual beliefs. Its elaborate gestures, which include the hand, face and eyes, are a kind of sign language, and are accompanied by fast footwork, with the body upright and legs bent. Ragamala’s Written in Water portrays the movement of the soul through spiritual longing and love, detachment from material life and unity with the divine. Besides the ups and downs of the game of paramapadam, a quintessential wheel of fortune game, Aparna and Ranee Ramaswamy used the 12th-century Sufi text The Conference of the Birds and the mythological Hindu story of the churning of the seven seas as inspiration for their dance. But even though the culturally specific details of these stories may be lost on the viewer, the dance itself is not. The measured work of the dancers carried a glittering quality that, while ephemeral, was never without sensual beauty. This was especially true of the two Ramaswamy sisters. Aparna is a charismatic dancer with an intensity of purpose that holds the viewer’s attention close. We never doubt that she has a profound story to tell. Ashwini Ramaswamy has a more delicate and even contained quality to her dancing, which frees one to experience a kind of lightness and joy. As they danced, their anklets shuddering, their red dyed finger tips and toes highlighted minutiae of movement and rhythm. With the excellent music and singing, the dance rode on waves of enchantment.